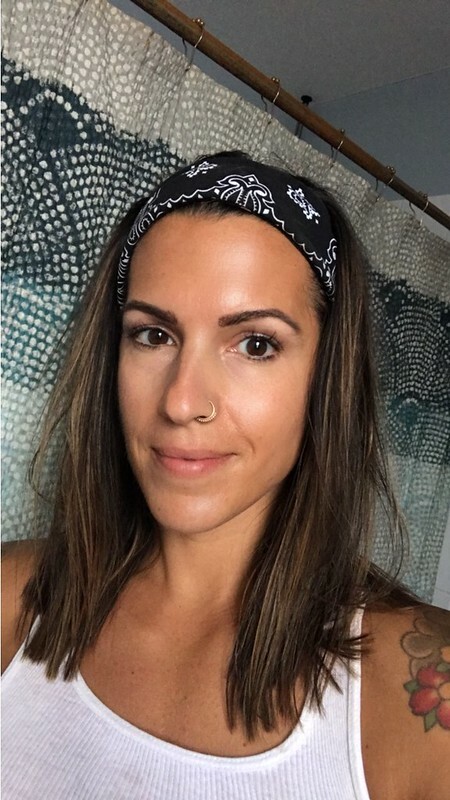 Throughout high school, much of college and to be fully honest, well into my late 20’s and early 30’s, I always struggled with my skin. Chronic hormonal acne, cystic acne, zit beards, backne (if you don’t know, this is short for back acne and it’s totally fun), unexplained breakouts that weren’t exactly pimples and weren’t allergic rashes – ya know, all the usual suspects. I never had a full face of explosive cystic acne that would create an absolutely epic “before” photo for a blog post like this. I generally just wouldn’t allow photos to be taken of me when it was at it’s worst. But, I also cannot really recall a time that I ever had fully “clear” skin. There was always something. I got pretty good at mastering the art of coverup, I tried what seemed like every over-the-counter and prescription creams and gels, took several rounds antibiotics, absolutely terrifying pharmaceuticals (see also: Accutane), I spent money on mineral-based cosmetics and nicer brands. None of it helped. My skin has come a very long way. These days, I am happy to share that I have super clear skin, very few, if any breakouts ever, little to no scarring or residual marks from the years acne and an even, smooth skin tone. I have skin that actually glows. I never thought I’d see the day! A rare makeup-free selfie. No filters. No editing. Full disclosure: Great lighting. Filled in brows and I have eyelash extensions. No makeup on my skin, just washed and pat-dried skin with moisturizer and facial oil. I know many of you want me to tell you about the one single thing I did to clear my skin. The one magical product that helped my hormonal breakouts. The one way to get rid of cystic acne. Phew, I wish it were that easy. You guys, it’s not. It’s just not quite that simple. But, in this multi-layered approach to healing my skin, each piece is important and likely dependent on the others, but none of it is overly complicated. It’s about being informed and making choices that work for you on a foundational level, so you can be on your way to clearer, more beautiful skin! For good. Eating a clean and balanced nutrient-sense, properly-prepared, whole foods based diet, that includes healthy fats and proteins, as well as unrefined, complex carbs and a conscious removal of refined sugars from my diet – this probably was what brought the most drastic improvements on my quest to heal my skin. 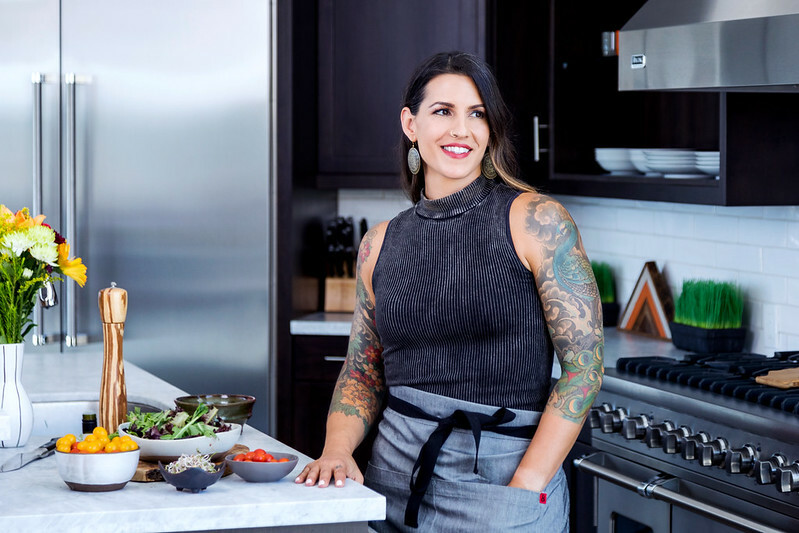 Beyond that initial shift, I would say addressing my digestion on a foundational level, healing my gut and dealing with underlying dysfunction and dysbiosis, this was equally as, if not more, important to the equation. Finally, getting rid of toxic, skincare products and cosmetics, this was the last piece to the puzzle, to allow my skin to truly shine and glow, to reduce uneven skin tones, acne scars and blemish marks, dark spots and reducing the fine lines that come with age. I cannot emphasize enough that what you put ON your body is just as important as what you put IN your body. When our digestive system is working properly, and our guts are in peak working condition, we give our bodies the chance to actually absorb, assimilate and utilize all of the important nutrients from the nutrient-rich, whole foods we consume. All those nutrients are distributed to different areas in our bodies, to the various systems and organs, of these important recipients is the largest organ in the body – our skin. Beyond the need to assimilate the nutrients from our food, to feed our skin from the inside out, we can also struggle with acne, rashes and other skin conditions due to hormonal imbalances, which can also be a direct result of dysfunction in the gut, a bogged down liver which is supposed to effortlessly filter out and excrete excess hormones on the daily and/or gallbladder issues which can cause problems with properly breaking down our fats and assimilating the nutrients necessary for creating new essential hormones (fat is a crucial precursor in the formation of all hormones). Finally, chronic skin issues can be a symptom of systematic need for detoxification and quite literally a sign of toxic overload within the body. 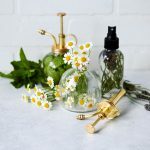 Healing our gut, addressing dysfunctional digestion, leaky gut syndrome, chronic dysbiosis – these are the first steps to beginning to heal our skin, from the inside out. Stay hydrated: water is the most crucial, simple nutritional deficiency that can be very easily remedied. Read more about how and why to stay hydrated, how much water to consume and more. 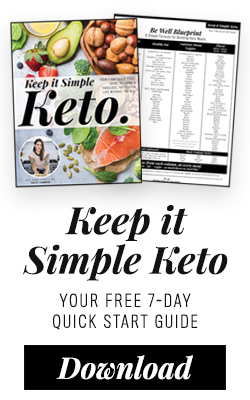 Consider an elimination diet: Some common protocols include the Autoimmune Protocol, Whole30 and The 21 Day Sugar Detox, whichever protocol you take on it’s important to stick with it long enough, I recommend at least a minimum of 21 days, (though I would personally recommend much longer, if you have more complicated issues or AI conditions). 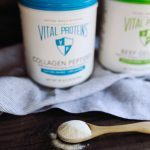 It is vitally important to then slowly, methodically, reintroduce possible trigger foods to determine if there are any foods possibly causing allergies, sensitivities or intolerances that need to be removed permanently or temporarily, while healing the gut. Chronic exposure to foods we have intolerances and allergies to can cause leaky gut, gut dysbiosis, immune issues, hormonal imbalances, allergies, chronic skin issues and lots more. Common triggers: gluten and grains, dairy, eggs, legumes, sugar, nuts and seeds, nightshades, etc. Reduce stress: Stress can cause a myriad of cascading issues, many of which can result in an unhappy gut, digestive dysfunction, chronic output of stress hormones like cortisol all of which can absolutely affect our gut health and in turn, our skin. Get adequate sleep: Sleep is an important time for our body to restore and repair. Without adequate sleep we can suffer from chronic digestive issues, stress management, difficulty losing weight and more. Take L-glutamine: an essential amino acid, that is anti-inflammatory and acts as a protector, coating your cell walls and is necessary for the growth and repair of the intestinal lining. Take 2-5 grams of L-Glutamine powder twice daily, while actively healing your gut. Consume healthy probiotics: ideally from non-dairy fermented food sources like coconut milk kefir or coconut milk yogurt, sauerkraut, beet kvass, kimchi, kombucha and other fermented foods etc. 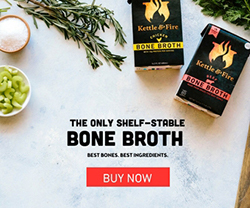 – fermented foods contain organic acids that balance intestinal pH and the probiotics to support the gut and the proliferation of a healthy bacteria and crowding out of the bad bacteria and other pathogens. Probiotics also help to reduce inflammatory and work to produce various essential vitamins. Include coconut oil: rich in saturated fat called lauric acid, coconut oil has antimicrobial and antifungal properties, it is also a natural anti-inflammatory, which can help soothe the intestinal lining and improve inflammatory bowel conditions. Reduce/eliminate refined sugars and processed, refined carbohydrates: even those that are gluten or grain-free, paleo-friendly, etc. These foods can cause inflammation systemically and definitely within the gut and digestive tract, they can feed pathogenic bacteria and yeast and can generally irritate an already not-too-happy gut. Consider additional lab testing: as needed, such as a comprehensive stool test to diagnose or rule out parasites, H. Pylori, bacterial overgrowth, dysbiosis, there is also testing for SIBO, candida, etc. – left untreated these can all act as major roadblocks to long-term gut healing and consequently any hopes of clear, acne free skin. Eat nutrient-dense real food: it is especially important to avoid: highly refined sugars and carbs, gluten and grains, refined vegetable and seed oils and artificial sweeteners, alcohol and any other foods you have determined you have sensitivities to. Stay hydrated: hydrated skin is happy skin. Staying hydrated reduces the appearance of fine line and pores, it also helps rectifying the dullness of your skin. Vitamin A: Vitamin A is critical to the repair process of the skin, especially from sun damage and damage from toxins (toxins can be found in the environment around us, in the food we consume and the products we use in and around our skin). Vitamin A also increases the thickness of the epidermis (the top layer of our skin). Great sources of Vitamin A are Cod Liver Oil, grass-fed beef liver, pasture-raised egg yolks, whitefish, yams, kale, collard greens, dandelion and other vegetable and fruit sources provide vitamin A precursor – Carotene. Vitamin D: Vitamin D is a major contributor in the process of skin cell metabolism and growth, which is why you may notice that skin texture improves after time in the sun. Vitamin D taken orally and applied topically is super helpful in the treatment of psoriasis, itching and scaling. Sources of vitamin D are sunshine, Cod Liver Oil, salmon, sardines, wild caught tuna, raw milk, pasture-raised eggs, liver. Vitamin E: Vitamin E is a powerful antioxidant that can help to reduce the effects of sun exposure on the skin, as well as the effects of dangerous free radicals. Deficiency of Vitamin E is also associated with acne. Avoid polyunsaturated oils (vegetable oils, example: canola oil, cottonseed oil, soybean oil, etc), which use up vitamin E. Sources of vitamin E are Cod Liver Oil, sunflower seeds, virgin olive oil, pecans, almonds, walnuts, hazelnuts, avocado, asparagus, beet greens, mustard greens. Incorporate more zinc in your diet: zinc is an essential trace element that many people are deficient in. Zinc plays a vital roll in cell division and regrowth, meaning it helps the development of new skin. Zinc also helps the skin produce adequate oils. Zinc also helps transport vitamin A in your blood, and it also helps the enzyme that converts vitamin A to retinol. Consume adequate healthy fats: Not only do healthy fats help to moisturize your skin from the inside out, fats are also precursors to hormone production, and oftentimes breakouts and acne can be linked to hormonal imbalances. Remove and replace toxic skincare and cosmetic products with safer choices!!! Much like the food we eat, I firmly believe it is important to ditch products and ingredients used on our skin that are highly toxic and have a high potential for irritation. In the morning I wash my face with one of my favorite cleansers, I do a very gentle, pat dry with a clean towel, I then apply a thin and even layer of daytime moisturizer all over my face and neck. Next I spray my face and neck with a toner or a mist and finally I add a few drops of a facial oil or serum to my face and evenly distribute. In the evening, same process, but I (often) use a different cleanser than what I used in the morning, a nighttime cream moisturizer, a toner or mist and again, a few drops of a facial oil. At night I gently apply a thin layer of eye cream around my eyes. I apply a facial mask, usually once a week or spot treat with the charcoal mask, as needed, for blemishes. I apply sunscreen to my body and face, anytime I will be in the direct sun longer than 30 minutes, or so. Lip conditioners and balms are as needed. Look for a future post on my current safer, cleaner cosmetic routine. Beautycounter has been on my radar for quite sometime now. A couple years, in fact. But full disclosure, I had an all-natural skincare line that I was decently happy with and had pretty good results with, so I was slightly worried about switching and throwing my skin into a tizzy. I was already using “cleaner” cosmetics that performed wonderfully. I was good. No need for anything new. Then, I read Beautycounter’s Safety Mission, I did some research on their advocacy and their commitment to safer skincare and cleaner beauty products, I checked out The Never List, a list of approximately 1,500 potentially harmful ingredients they will NEVER use. I was intrigued and inspired. 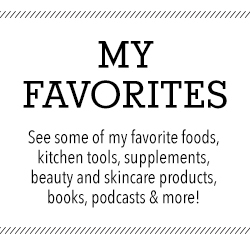 I finally tried the products earlier this year and incorporated them into my (what I thought was) already pretty-darn-crunchy, clean, non-toxic personal care, beauty and skincare routine. Honestly, the products speak for themselves. They out performed ALL of the products I was previously using, by far. They felt better going on and my skin has been the happiest it’s ever been. I love that not only are the products working really well for me, but I can trust that they are safer than absolutely anything else that is out there. 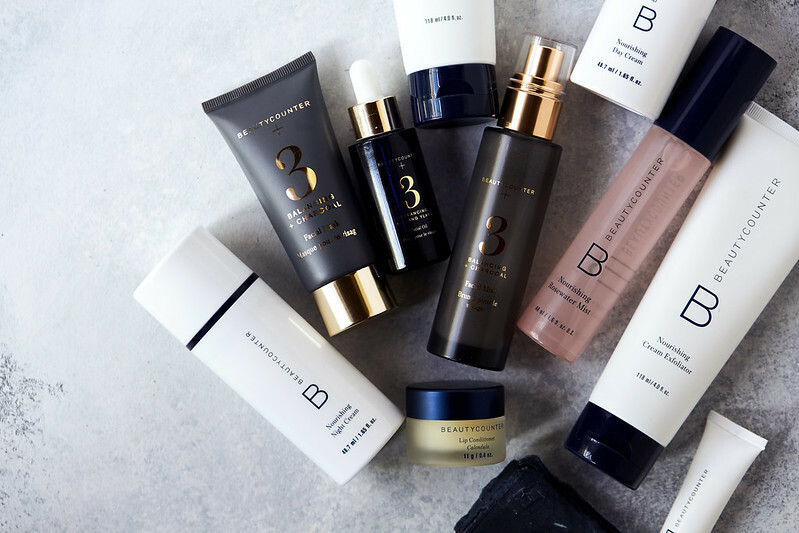 Beautycounter has a rigorous screening process for all ingredients and their supporting science; most products rate a 1 or 2 with the Environmental Working Group. Beautycounter’s color-based cosmetics are also batch tested for heavy metals three times before they become available. 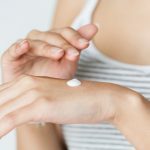 The European Union has banned more than 1,400 toxic chemicals in the formulas of personal care products and placed restrictions on levels of over 250 more. In the U.S. this industry is governed by a measly 1.5 pages of legislation that hasn’t been updated since 1938. Companies are allowed to use any these harmful ingredients (banned in the EU) and make their own judgments about safety. If that doesn’t infuriate you, maybe the fact that many of these banned chemicals are endocrine disruptors, cause reproductive issues and are known carcinogens, will. 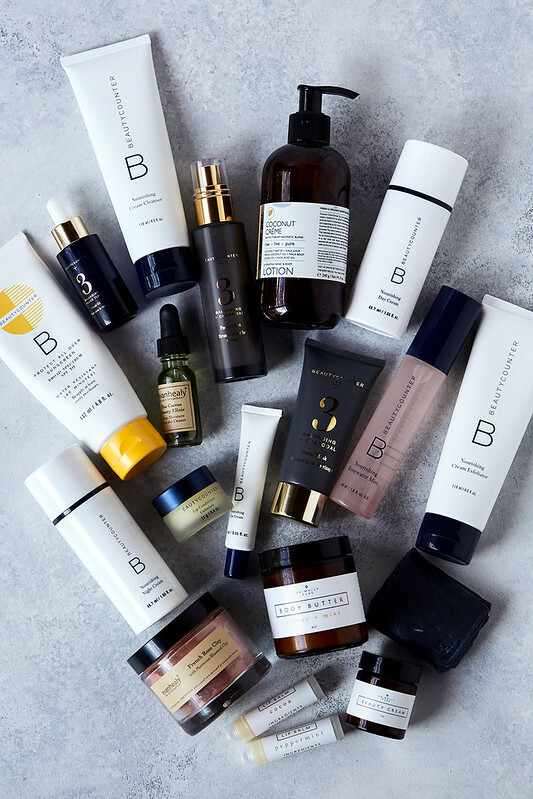 Beautycounter is not only doing the research to seek out safer ingredients for their products, but they are also very actively advocating for legislative change that moves the entire industry forward. For your convenience, you can go here to print out your own “Carry With You Never List” for easy reference when shopping. And if you’d like, go to the Environmental Working Group and see how YOUR current personal care products and makeup rate for safety. Cosmetics. More On That Soon. I am currently implementing Beautycounter‘s line of cleaner cosmetics after recently shifting from Honest Beauty. Though I do still have a few favorites items (that aren’t squeaky clean) from other companies, too. I am working on writing up a post, sharing my favorite cosmetics, so look for a post about my favorite Cleaner Cosmetics, soon. Don’t spend even one more day putting toxic chemicals on your skin! Start your NEW safe beauty routine now! 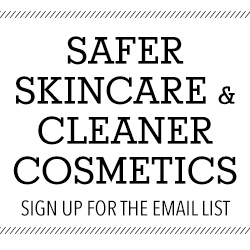 Do you have questions about safer skincare and cleaner cosmetics? 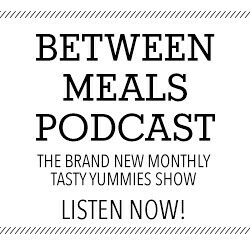 Please reach out to me at beauty@tasty-yummies.com and share your details, goals and questions and I will do my best to help and guide you. 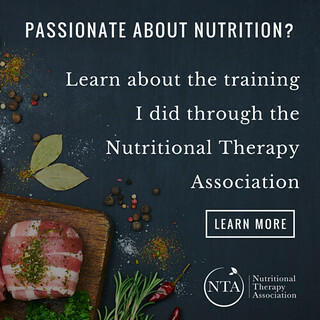 If you are interested in addressing your skin and nutrition from a foundation level, through one-on-one Nutritional Therapy Services read more here and reach out. If you’ve been considering joining this mission with Beautycounter, please contact me. I work on a team with my good friend Diane Sanfilippo as my mentor, we’d love to have you join us in the movement.